There are lots of reasons for selling a Long Island NY home, but there are many reasons why getting the home inspected first can be a key selling feature to buyers. Why Get An Inspection Before Selling a Long Island NY Home? One of the biggest reasons for getting your home inspected before you even put it on the market is, it helps your buyers see you as an honest seller. This makes the process more amicable as fears of being swindled are reduced and a certain trust factor is established right up front. Getting a home inspection done if you're selling a Long Island NY home also protects your interests. Many people fear getting a home inspection because it may reveal detrimental things about the house that need to be fixed. On the other hand, it may uncover advantages in your home that enhance its value that no one knew about before. This gives you more power at the bargaining table. Imagine being able to increase your asking price because your home inspector discovered something new about the building. The home inspector can also offer tips on improvements that need to be made. Often time these improvements may enable you to increase your asking price for a lot less than having a buyer find the problem and request that you reduce the price when they make an offer. On the flip side, getting a home inspection can serve as a heads up. If there are major issues, such as a damp basement, these are highlighted so you can get them taken care of before putting the property on the market or reduce your asking price to compensate for the flaw. Failure to do this could lead to you wasting your time and efforts. Buyer after buyer may turn down your property after getting the place inspected themselves. They may decide that for the asking price there are simply too many flaws and things to be fixed. You are also protected from asking for an unrealistic price and having the unit avoided like the plague because of an asking price that is just too high. You're also protected from unfounded claims by a home inspection after an offer is made. This means if a defect emerges after the sale and your home inspection report does not support this flaw then you have your inspection to fall back on supporting your side of the deal. No need to be forced to use the proceeds of the sale of your home to effect renovation to a home that is no longer yours. If you're thinking of selling a Long Island NY home, call a home inspector to check out the property first. Protect yourself and your family from unnecessary problems. Every now and again, we get a buyer who says to us, "Why do we need to get a Long Island NY home inspection?" Or "Why is it so important to get a Long Island NY home inspection?" Or "Why should we get a home inspection if we're buying a new home?" The temptation is there for skipping a Long Island NY home inspection and saving the few hundred dollars the inspection will cost in order to buy a piece of furniture or new curtains instead. Our advice? Don't Do It! We have other articles on the importance of getting a Long Island NY home inspection in the Long Island NY Home Inspection section of articles to your right under Long Island NY Real Estate Categories. Be sure to follow us on Twitter for daily updates concerning real estate, mortgages, and other business related to home buying. Many flipped Long Island NY houses are houses that have gone through foreclosure or a short sale, have been purchased by an investor, some cosmetic repairs made, then put back on the market for unsuspecting home buyers to fall into. If you're thinking about looking at flipped Long Island NY houses as an option to find a good deal, there are some things you need to do and look for in order not to get ripped off in the process. Being in the business of seeing and showing a lot of homes, we can testify to the fact that a vast majority of flipped Long Island NY houses are just plain shoddy homes that have been covered with a layer of makeup. Always, always, always — get a home inspection on any home you plan to purchase, especially flipped Long Island NY houses, which tend to be more risky. The price of a home inspection is small compared to the price you might end up paying for some major home repair. Do yourself a favor, don't skip the home inspection. Selling Long Island homes isn’t cut and dry these days. With fewer numbers of homes on the market, buyers are easily scared off if they encounter problems that may negatively impact resale value. Among the many negative issues that need to be addressed in order to make a house more marketable in the future are foundation problems. They rank near the top of the list. If you’re among those “very few” currently selling Long Island homes right now, you should have already made sure that the property is competitive with similar properties in the area. A little dampness in the basement or a small drywall crack are flaws that a potential buyer may be willing to overlook, but a cracked or bowed foundation wall will be a major red flag. Since the sale of most Long Island homes are contingent on a satisfactory home inspection, foundation problems are very likely to stop a home sale dead in its tracks. Some foundation problems are obvious. Long Island homes with cracks, leaning chimneys and bowing basement walls, for example. But there are other symptoms that may signal a settling or shifting foundation. Windows or doors can be racked by a shifting foundation and become difficult to open and close. Drywall cracks that extend from the corners of windows and doors are another telltale sign. As surprising as it seems, newer Long Island homes may be just as likely to have foundation problems as older ones. In today’s economy, it’s understandable for homeowners to put off home improvements until they feel more financially secure. But it’s important to make a distinction between basic “feel-good” improvements (like painting a room or installing shelving) and repairs that correct safety issues or prevent a problem from getting worse. Fixing damaged foundations in Long Island homes definitely falls into the “must-do” category. It’s risky to put off fixing a damaged foundation. If a crack starts to enlarge or a wall starts to buckle, you’re seeing a failure that is probably going to get worse. The longer you wait, the more extensive the problem becomes and the more expensive the repair is going to be. The good news about foundation problems is that most of them can be corrected, as long as the contractor has the training, tools and materials to do so. Many local remodeling contractors only temporarily fix cosmetic problems, but are unable to permanently solve the problem. Do your homework if you have serious foundation problems and be sure to hire an expert who is trained in doing the job right. For more information on Long Island NY home inspection articles, visit our Long Island NY Home Inspection Category under our Long Island NY Real Estate Categories to the right. Be sure to Find us on Facebook, and Follow Us on Twitter. You found the perfect Long Island home, your offer was accepted by the seller, and now it is Long Island home inspection time! Home inspections are very important during the home buying process. 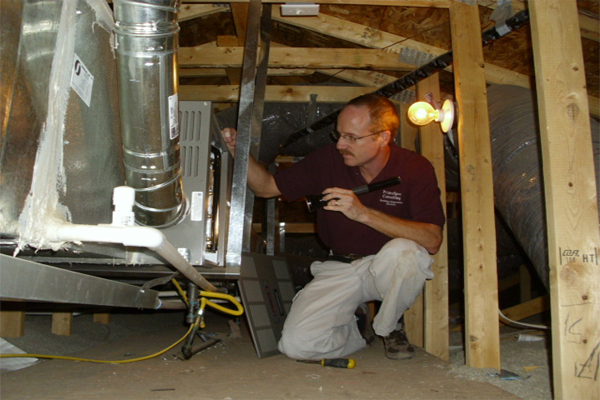 Your certified home inspector is quite skilled at discovering underlying problems with a structure. If your inspector does find a problem with the home you are buying, they usually have several ideas on how to correct the situation. If there are only a few problems and they are relatively minor, you may elect to correct the problems yourself after you move in. If your inspector finds a major problem, you may need to discuss this at length with your real estate agent. Regardless of whether any items are minor or major, your home inspector will give you a detailed report of all of the problems, and potential problems, they discovered during the home inspection process. A major problem with the home is usually addressed in a repair addendum. The repair addendum is simply a list of defects that were discovered during the inspection process. The addendum is written up by the buyers’ real estate agent and signed by the buyer. The repair addendum is then delivered to the seller’s real estate agent who delivers and discusses the addendum with the seller. At this point, the buyer waits for a brief time, usually a day or two, while the seller considers whether to make the requested repairs, refuse to make the requested repairs, or offer money off of the price of the Long Island NY home, if the buyer will accept the house as it is. In most cases you can come to some type of arrangement with the seller regarding any problems you discovered in the house. Buying a Long Island house is an exciting adventure and a huge financial investment. Unless there is some underlying circumstance that prevents it, always get a home inspection of any improved real estate you are considering buying. The price of a home inspection is miniscule when compared to the price of a new roof, or some other major home repair. Do yourself a favor, don’t skip the home inspection. For more Long Island home inspection tips, visit the Long Island home inspection section of our website to your right. And be sure to Find us on Facebook, and Follow Us on Twitter.